My Holiday is the perfect mobile application for a perfect holiday. Hotel guests can easily find hotel info, restaurants, entertainment packages and other interesting services & hotel facilities. Easy to use, both for hotel staff and end-user. Hotel guests just need to download the app and login to the hotel they are staying at to find everything they need to know in one place, at the touch of a button. 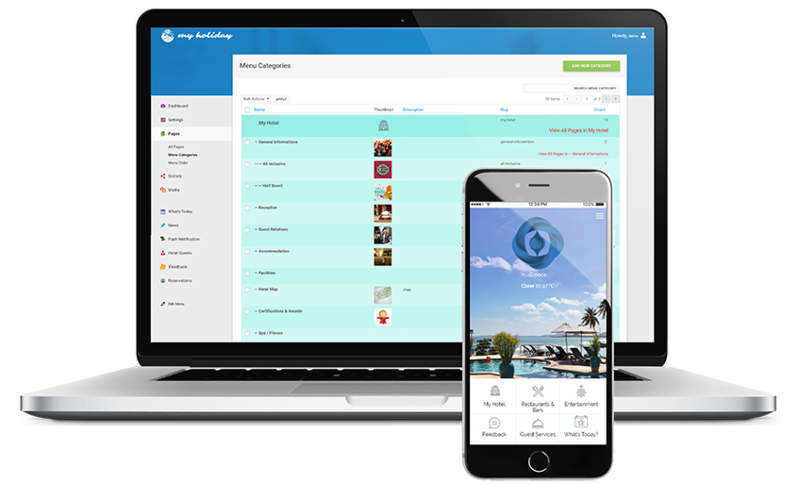 Easily update or add information about your resort from the app admin interface. Manage multiple resorts from the back-end, just by selecting the hotel. 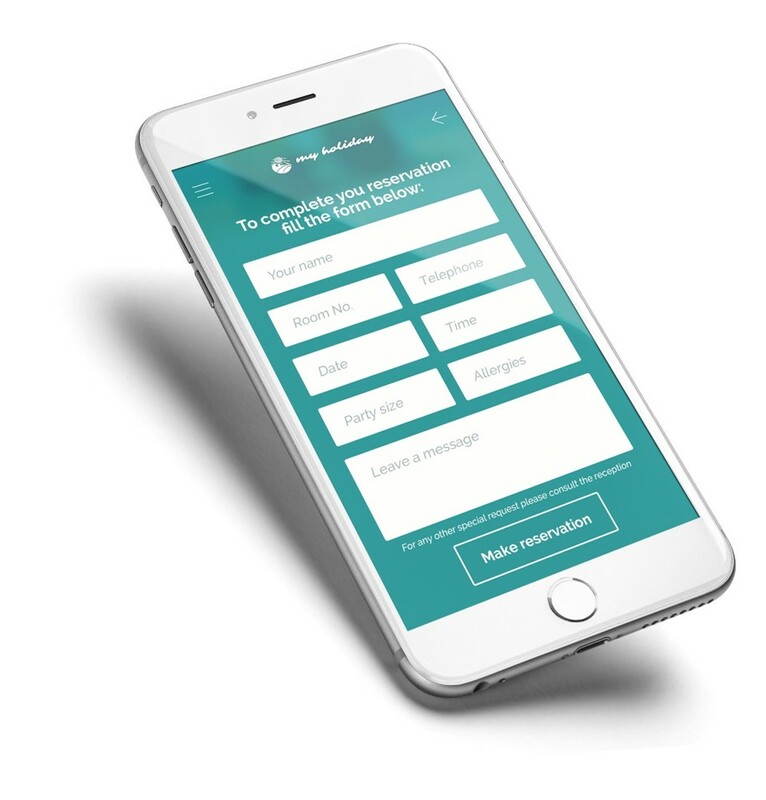 Engage with your guests through myHoliday app. Welcome to My Holiday, a friendly and easy to use holiday guide. Your guests just need to download and install the app to have instant access to all hotel information and facilities, restaurant timetables, happy hours, sports activities, Spa packages and much more. Hotel guests can also find travel information, places to visit, transportation options and nearby shops. Everything they need need to know, in one application. Sit back, relax and enjoy your Holiday. Notify your previous guests to send a feedback regarding their stay. Integrated iFeedback within the App, a tool for maximizing contact and optimizing your business. Our application has 6 major, basic categories. Users can navigate with ease, find what they need and make their holiday brighter and memorable. One of the awesome things about our App is the back end. This is where you have easy access to every part of the application — manage your Reservations, send Notifications, have access to iFeedback, access your hotel’s Guests, manage the content on your application. All in one place. Magic! As more and more hotels and resorts use the app, people all over the world are being connected. Our community is increasing day by day, because our application saves time for hotel guests and management as well. Reach your guests easily, engage with them through our application. Buy the App and make it your own! From My Holiday into your hotel`s personal App. myHoliday is available for both Android and iOS mobile operating systems. We have a dedicated team who can help you with the setup and working in the back-end. Select the package you want: basic package or pro package. After this, all you have to do is tell your customers about the application. With your brilliant ideas or if you want to join our comunity.